Vega Pederson – Since I was elected in 2012, I have represented East Portland (HD-47) in the Oregon House, one of the most diverse districts in our state. The needs of communities of color, immigrants, and refugees in East Portland have been my priorities as a state legislator. I led the fight for paid sick time, increasing the minimum wage, the driver’s card, tuition equity, and combating immigration consultant fraud. I believe that the best way to represent my constituents is to build relationships with communities to hear their needs and work together for policy solutions. I have done so as a state legislator and will continue to as County Commissioner. Vega Pederson – The new Motor Voter law, passed in the 2015 session, has helped to expand voter access to Asian and Pacific Islanders, putting ballots into the hands of many who have not taken part in the political process previously. The continued implementation of this policy, as well as the information given to new voters through our county elections offices about the process are important next steps in engaging in the political process. Beyond voting, it is organizations such as APANO that help to increase involvement and input in our policy formation process. Vega Pederson – As the first Latina elected to the Oregon House, I have worked to combat anti-immigrant policies and racist rhetoric. As County Commissioner, I will continue to take an active role in supporting our immigrant communities, just as I did as a Chief Sponsor of the Driver’s Card bill and as a vocal advocate for Measure 88. I see my role not only as combating these discriminatory policies but also as leading on policies and supporting programs that help all of our communities. Vega Pederson – As County Commissioner, my policy priorities include working to expand and support early learning and SUN Community Schools which provide wrap around services and culturally specific support that help our Asian and Pacific Islander students and communities. Additionally, I will work alongside Chair Kafoury to ensure that as we work for affordable housing policies and public investments in our neighborhoods, we aren’t displacing our communities. Vega Pederson – I have stood up for the needs of East Portland and all of our communities as a state legislator, and I will continue to work to build a county government that works for all communities and provides the services and access needed. 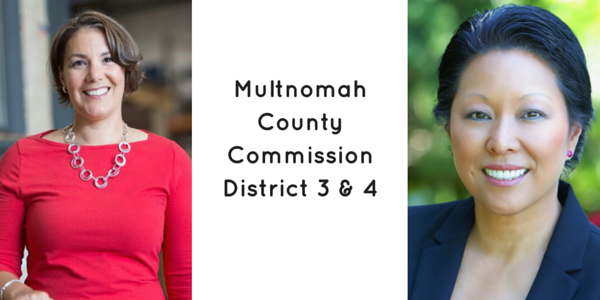 As Multnomah County Commissioner, I will work to make Multnomah County a better place to live, work, and raise a family for all of our community members. Stegmann – As a woman of color who grew up in Rockwood, one of our most impoverished neighborhoods, I have lived the barriers that minorities are struggling to overcome-that is why I am running. I want all people to have access to the same opportunities. I am a doer. When a neighborhood was blanketed with racist information, I searched for a positive way to combat hatred and intolerance. I contacted Joe McFerrin, POIC/Rose Mary Anderson High School and asked him to host a screening of Martin Luther King Jr’s documentary “The March”. Joe was so excited to bring this important film to East County that it will now be an annual event. This event is an example of how when you bring the community together they will rise to meet the occasion. I have experience that matters as a Gresham City Councilor & Gresham Redevelopment Commissioner for the last 6 years. I served on the Planning Commission. For 22 years I have been a small business owner, a mom for 17 years and a Soroptimist board member. That power lies within ourselves. We must lead by example and through that leadership is how we empower ourselves and others. According to www.aauw.org “Barriers and Bias the Status of Women Leadership” our US State legislature is 75% men and 25% women. Of those 25% women, 5% are women of color. Business execs consist of 63% white men, 24% white women, 2% black women, 1% Hispanic women, 1% Asian American women. I will be the first Asian American to serve on the Multnomah County Commission & only the 5th person of color ever elected to that board. I hope to serve as a positive role model for all of our community, but particularly for people of color. I believe it is incredibly important to see elected officials that are representative of the community in which they serve. I am one of two minorities that currently serve on the Gresham City Council. Seeing is believing. Stegmann – Blaming and lashing out at others is a symptom of fear-that there isn’t enough to go around. When you live your life in fear it is difficult to keep your heart and mind open. I try to live my life with an abundance mentality vs a scarcity mentality. I will look for ways to bring people together not divide them, specifically around issues related to jobs and the economy. When people feel economically secure it’s easier to address difficult issues like race and bias. Every race and/or ethnicity share many of the same values: we love our children/families, we take pride in a hard day’s work, we value education. We want to know that our lives mattered and leave a legacy for our children and grandchildren. In my opinion we are all one race-the human race. I will seek out opportunities to unite our community that will shed light on the darkness. Stegmann – Housing affordability is my number one priority. We must have an appropriate housing policy that meets the needs of everyone no matter what end of the socio-economic scale you are on. We need to find ways to reduce building costs that encourage appropriate development. HomeFirst Development has found ways to reduce building costs significantly. Increasing the supply of affordable housing is critical. I will also focus on jobs and economic development. We have an urban renewal area that I serve as a commissioner for. This redevelopment -Rockwood Rising, will create an economic engine to support local entrepreneurs and will help create living-wage jobs. Thus discourage serial displacement by giving local residents educational and entrepreneurial opportunities. I am very supportive of the new Asian Health & Svc Center that will provide culturally-specific services/programs and behavioral & physical health care to 3/4 of Oregon’s Asian population that live in the Portland Metro area. Stegmann – I have the experience necessary to be a strong, compassionate, well informed leader. As an Asian American, I understand the barriers that minorities face because I live them, just as your members and supporters do. I have an understanding of the sacrifices and hard work it took to come to this country with nothing. We are all here because we want a better life for our kids and families. We are all immigrants unless we are Native American Indian. I will fight for equality and equity.